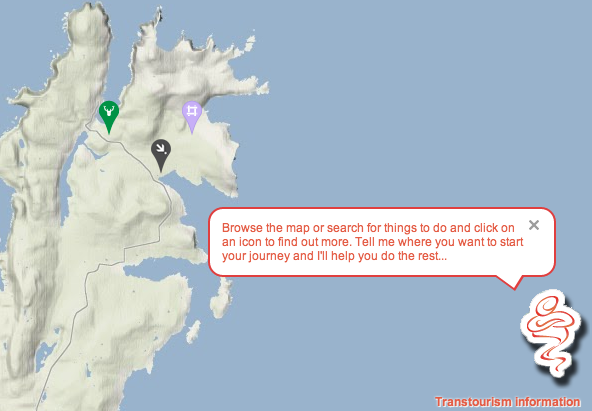 I discovered an interesting tool for travel in the Highlands and Islands a while ago called Journey Genie. If I recall, they followed me on Twitter and invited me to explore their site and write a review. Being a big fan of travel and the Highlands and Islands, and being hugely passionate about the opportunities that lie in the region, I was delighted to take up the invitation. Billing itself as a “Highlands and Islands journey planner” I decided to see just how good Journey Genie’s planning capabilities are by starting an itinerary at one of the extremities of the region: Haroldswick, the most northerly village in Unst, whch is the most northerly inhabited island of Shetland. I visited Unst in 2009 and it’s a lovely part of the world. So I entered “Haroldswick” into the main page (right) which looked not unlike Google’s main search page, and here I met my first problem: there was no auto-complete. I would have expected that a website about a region with such a diverse linguistic heritage would offer a bit of help in spelling. No doubt many people with varying competences in English will begin entering some of the region’s strange-sounding Gaelic or Norse names, or even just clumsily Anglicised names, without being fully confident about their spelling. Ask your average visitor to the region to correctly spell some famous place names they might have heard of – such as Urquhart Castle, Tobermory or the Trossachs – and there’s a good chance they’ll struggle. Heck, there’s a good chance some locals will struggle. So auto-complete would have been a real help. “Tell me where you want to start your journey”? I thought I did that on the previous page when I typed in “Haroldswick”. I looked around the page for a place to tell the genie (again) where I wanted to start, but the pop-up text box wasn’t clickable and there appeared nowhere else on the map to click. Until, eventually, I realised that I needed to type it on the complete opposite side of the screen in the left hand list of options, rather than next to or via the genie’s instruction which would have been infinitely more intuitive. 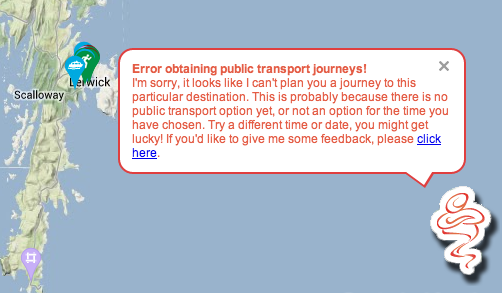 I doubted very much that this was the case, given Shetland’s excellent (by Scottish island standards) transport links. I googled “bus from unst to lerwick” and the very first hit told me that “The bus service from Lerwick to Baltasound, Unst runs 3 times a day and takes 2hrs 25mins”. Admittedly Baltasound is at the south of Unst and not the north like Haroldswick, but it nevertheless presented a solution for the vast majority of my journey, none of which Journey Genie could tell me. My second experiment was a kinder one – the presumably simpler and more common journey of Inverness to Portree, and I decided to leave at 8am on Saturday. This was the result. Perhaps it’s the pedant in me, but the first thing I noticed was the spelling mistake: “Here is you current itinerary”. The second thing was the straight-line route shown on the map, rather than something that would show the precise route I’d be taking along the A82 and A87, and which would be a more meaningful illustration of the things I’d be seeing along the way like Loch Ness or the Skye Bridge. The third thing was the proposed departure time: 1710, a full nine hours after my expressed departure time, a gap during which I am pretty sure there are two other bus departures from Inverness to Portree. Fourthly, and perhaps most importantly, I noticed that the screen didn’t – without clicking further – tell me the transport options. The main choice, of course, is the bus (not that the result made this clear to me). But it is also possible to take the beautiful train journey to Kyle of Lochalsh and change on to a bus from there – an alternative that you would want to consider if time is less of a concern. But there was no indication that such a choice might exist. To present such an error-strewn result, especially to would-be tourists who perhaps don’t know any better, is embarrassing at best, and highly damaging at worst. Figuring that Journey Genie was not excelling itself on journey planning, I then noticed the tab on the left that said “Things to do”. Intrigued as to whether there would be any better news on this front, I found a list of suggested itineraries that looked like it highlighted some great opportunities for exploration and discovery. “Black Isle Museums” was one of the first that caught my eye, so I clicked on it, only to find that the list of museums included one in Dingwall and one in Strathpeffer, towns that – as far as I know – are not actually on the Black Isle. I clicked on a second one, “Inverness Day Out”, on the assumption it would present some ideas for a nice day out in Inverness – but no, they were sights and attractions beyond Inverness. So clearly there was a failure to clearly communicate the difference between days out in Inverness, and days out from Inverness. It’s an important distinction for visitors. At this, I gave up. Journey Genie did boast a link to “Help videos”, but I intentionally didn’t use them, for the very simple reason that I shouldn’t have had to. A website should be easy to use to a new visitor, and it shouldn’t make you puzzle over its operations to the extent that you would need to resort to a video. A video that perhaps inspires you about the subject matter, yes, but not a video that needs to tell you how to use the website. “Don’t make me think” is a great principle that websites should adhere to, in that they should be instantly useable and navigable without any extra help or explanation. This is particularly important when the user might be an overseas visitor whose English might be such that slowly navigating a static page in your own time may be much better than trying to understand a video. I’m surprised that Journey Genie didn’t try to make their website a bit more foolproof – or indeed multilingual – as a result. So on the specifics, at least based on the above experiments, Journey Genie sadly and miserably failed. But I had some general concerns about the website too. Firstly, why just the Highlands and Islands? It’s obviously great place to explore and much needs to be done to provide help on the region’s multifarious and often baffling transport options. 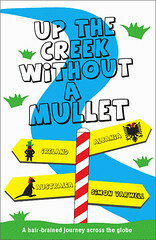 It’s a region that – distinct from the rest of the country – people will often focus their holidays and travels on. But despite its distinct identity (or should that be identities? 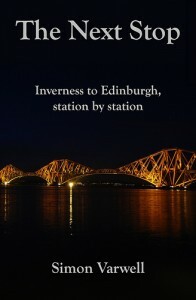 ), trips to the Highlands and Islands will also commonly involve travelling through other parts of Scotland. Therefore potential visitors will have wider queries about travel and transport when planning their trip, and may not think to isolate their journeys within the Highlands and Islands to undertake separate research. Secondly, what precisely is the Highlands and Islands? It’s a well-known area, but the boundaries are somewhat fuzzy. Does it include Moray and Argyll? How about the Perthshire Highlands, or the western parts of Aberdeenshire or Angus? Some people think that anything north of about Stirling is the Highlands – and whether that’s right or not, it’s unclear how the website engages users in understanding the extent of the region. Thirdly, why “Journey Genie”? It’s a lovely name that rolls off the tongue and could be quite memorable. 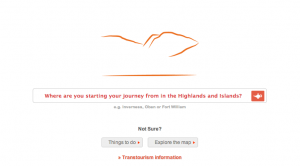 But it tells the user nothing in itself about its geographical focus of Scotland’s Highlands and Islands. Genies are known for their purveying of wisdom, but they’re hardly a highland thing. 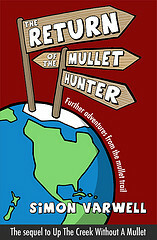 Why not a name that better evokes the region? It’s a minor quibble but, I think, a relevant one. Despite the great opportunities for exploration in the Highlands and Islands, and the beautiful locations and fantastic facilities you can encounter, there is also much that is wrong with the area that can impede enjoyment – such as atrocious public transport, high costs, frequently awful customer service, poor wet weather options for those not into outdoor activities, and much more. We don’t need to add a poor gateway into all of that to exacerbate the situation and put people off even more. According to the bottom of the front page of Journey Genie’s website, it boasts a number of supporters and funders, including Highlands and Islands Enterprise, VisitScotland, HiTrans and various European projects. That, very sadly, makes Journey Genie even more of a let down, because all that public money really should have delivered something better. There’s definitely a gap in the market for something that can introduce people to the Highlands and Islands, help them plan journeys, find their way around and discover the different things to do. So Journey Genie’s basic ambition cannot be faulted in the slightest. I’m just not sure, based on my attempts to use it, that it even remotely delivers on that aim. The only saving grace is that – hopefully – tourists will not be put off by Journey Genie and will find their solutions elsewhere.